Hillary Clinton abruptly left September 11 memorial ceremony in New York City Sunday after feeling “overheated,” according to a campaign statement. 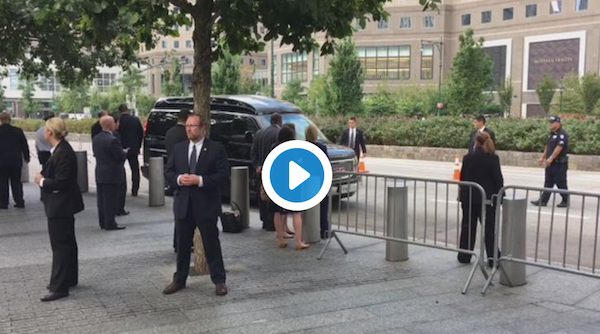 Clinton arrived at the September 11 memorial in Manhattan at about 8:19 AM, where she chatted with Democratic Senators Chuck Schumer and Kristin Gillibrand of New York and Joe Manchin of West Virginia. Clinton was expected to stay for most of the ceremony’s duration. Later, the candidate walked away from the area with Secret Service agents in tow at approximately 9:30 AM, before the end of the memorial service, according to reports. Below is footage of Clinton exiting the 9/11 some oriole ceremony.